Eastpak has really gone downhill in recent years. 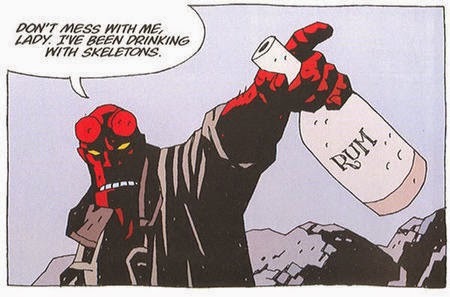 I’ve re-read the first two volumes of Hellboy in as many days. I find reading for pleasure easier when I change medium. The pictures are easier on the eye, the only words dialogue, caption and infrequent exposition. Working on a book all day only read another book for entertainment can be heavy going. Not so Hellboy, who has since gone on to spawn two films. So what’s so special about that big red brawler? The art is bold, easy to pass off as simplistic, in truth wonderful chiaroscuro. The pages are all heavy shadows and dramatic light, seemingly conjured from a just a few hurried lines. There’s an economy at work here that is fascinating. And those slabs of colour are much like the titular hero – no nonsense and straightforward. Hellboy inhabits a world wedded to a gothic past, where castles boast sinister statuary and graveyards are ancient and full of foreboding. There’s a pulp sensibility to Hellboy that you might expect from a superhero comic. Few are the problems that can’t be solved without the judicious application of fist to face, something Hellboy is well versed at. That he has the occasional wisecrack up his sleeve is no bad thing. 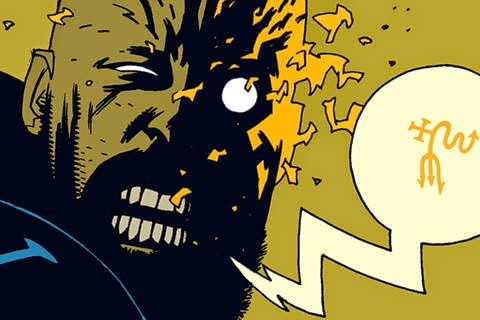 Reading Hellboy: required. Drinking rum: optional. While Hellboy is a fun character he’d be nothing without antagonists, and the bad guys have plenty of attention lavished upon them. His foes are creatures of legend, but also men seeking power for themselves. It’s this weaving of the historical with folklore that makes the comic such a rich read. Romanian Vampires rub shoulders with Nazis harboring apocalyptic visions, while Baba Yaga confides to Rasputin and so on. Warning: bringing about the apocalypse without supervision is dangerous. It’s a dark and melancholy set of tales with an indefatigable protagonist who is refreshingly upbeat even when world-weary.